Green Goddess salad dressing is kind of like ranch salad dressing, but with a ton of fresh herbs to turn the color a beautiful light green. 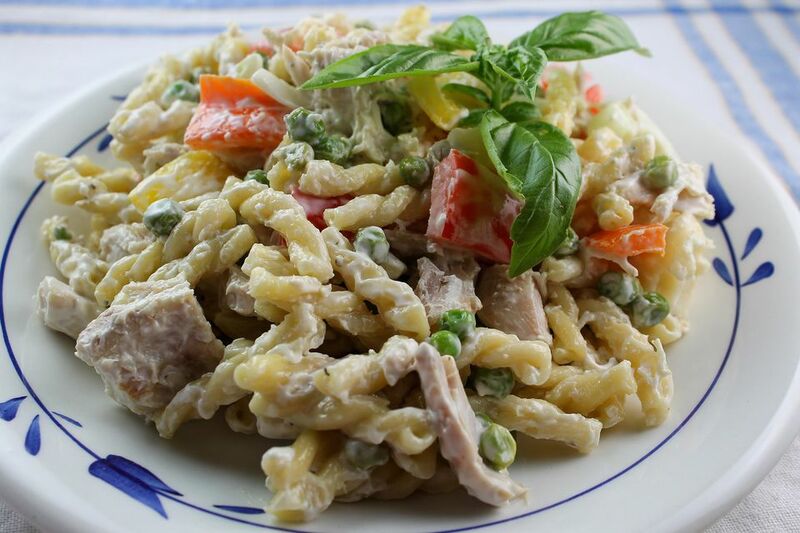 I thought it would be nice to use this dressing to make a cool and creamy pasta and chicken salad. Yum. You can make your own Green Goddess salad dressing for this wonderful recipe, or buy a bottle at the store. There are lots of varieties and brands of this classic and old-fashioned dressing. Combined with mayonnaise and lemon juice, it makes a wonderful sauce for tender pasta, chicken, and vegetables. You can, of course, add your own favorite vegetables and pasta to this easy recipe. Just make sure that you write down the changes you made so you can recreate it. I love serving pasta salads in the summer. I know that grilled foods are very popular this time of year, but on a very hot day, I am never in the mood to stand over a hot grill under the beating sun to cook food. Having a pasta salad ready and waiting in the fridge means dinner can be on the table in minutes, and everyone stays cool while enjoying a good meal. And since these salads are made ahead of time, there's no last minute scramble before you eat. Like all pasta salads, this easy recipe must be made ahead of time. Garnish each serving with some fresh basil leaves and serve with iced tea and some corn muffins on the porch for a wonderful summer meal. In a large bowl, combine salad dressing, mayonnaise, yogurt, and lemon juice and mix with a wire whisk until smooth. Set aside. In a large pot of water, add salt and bring to a boil over high heat. Add the pasta; cook, stirring frequently, until the pasta is just al dente (firm to the bite, but tender). Immediately drain the pasta and add to the dressing in the bowl; mix well to coat. Stir in the chicken, bell peppers, cheese, and the peas and mix gently but thoroughly until combined. Cover and chill for 2-3 hours before serving. Store any leftovers covered in the refrigerator up to four days.